This is a great spot for casual dining with elegant style, in a setting that evokes a chalet. It's located on the second floor of a famous gourmet shop called K�fer (similar to Harods in London or Gallery Lafayette in Paris). The cuisine roams the world for inspiration -- from Lombardy to Asia and everywhere in between. 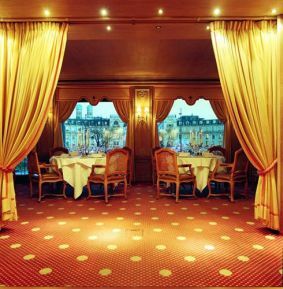 You select your hors d'oeuvres from the most dazzling display in Munich offering a veritable schmorgasbord from across the globe. Often K�fer-Sch�nke devotes a week to a particular country's cuisine ensuring that every visit is different. You may be privy to the classic soup of the French Riviera (sea bass with fennel) or perhaps some Thai green curry with lentils. The salads have what one reviewer called "rococo splendor." From a cold table, you can choose smoked salmon or smoked eel. Venison, quail, and guinea hen are also regularly featured. Be sure to check out the deluxe gourmet shop on the main floor afterwards, perfect for recreating some of the restaurants delectable treats at home.